Hands on: How to install free virtual Linux on Windows for safest surfing, or to compile a program with Linux. Follow these steps, and become a Linuxer within an hour (including download times by DSL or cable). 1. Download the free VMWare player from here (30 MB file, approx. 10 minutes via DSL). 2. Run the VMWare Player installation. This may take another 5 minutes; VMWare Player is a large application which needs to install some drivers and services. 3. Now all you need is a machine image to run. 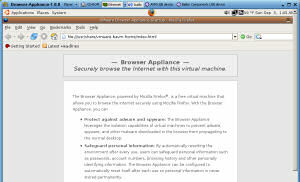 The VMWare site contains a 260 MB Browser Appliance, which is an Ubuntu Linux with pre-installed Firefox browser. Downloading 260 MB via DSL/cable may take half an hour. If you are impatient and want a much smaller Linux, have a look at VMWare's appliances directory. If you just want a surf station Linux, search for the 55 MB Damn Small Linux. And if you want to exchange downloaded files with the windows host, read on here how to do this. But my intention for a Linux download is not only to get a safe surfing environment, but also to upgrade this to a full Linux installation sufficient for software development. And this should be easiest with the Ubuntu surface. 5. After the download, unpack the .zip to some hard disk with at least 2 GByte of free space. The image files are 1 GB, but you have to provide some space as well for the VMWare memory image files, and further applications we like to install. 6. Run Browser-Appliance.vmx by a double click. The virtual Ubuntu is booting. There is only one user configured, so you don't have to enter a username - the full GUI with a browser appears instantly. 7. Make sure your VMWare ethernet settings are "NAT" (network address translation), and that connected is set. Then you should be able to surf with the given Firefox instantly. 8. C++ compilation with linux: let's open a shell through Applications / Accessories / Terminal. Typing g++ only tells "command not found". So we have to add the GNU C++ compiler. By the way, if you're irritated by the VMWare menu at the top of the screen, just click on the needle symbol, move the mouse down, and wait a second. The menu will disappear. Furthermore, you may press CTRL+ALT any time within VMWare player to leave the full screen mode and get back to windows. 9. To install software, enter System / Administration / Add Applications. Because you're about to administer the system, you'll be asked for the administration password. As told on the Browser Appliance download page, the only account is vmware with password vmware. So enter this. We enter the application installer in some kind of simple mode. It's actually a bit too simple - many packages don't seem to be available, so forget about this mode and select File / Advanced. and confirm the following query with yes. Now your Ubuntu should be able to install the most important applications. Of course, an alternative would be to download some up-to-date Ubuntu VM appliance, but these are at least 700 MB in size and may change on a monthly basis. Some packages will be downloaded. Whatever you're asked for (upgrade libc etc. ), just click Yes or Forward. 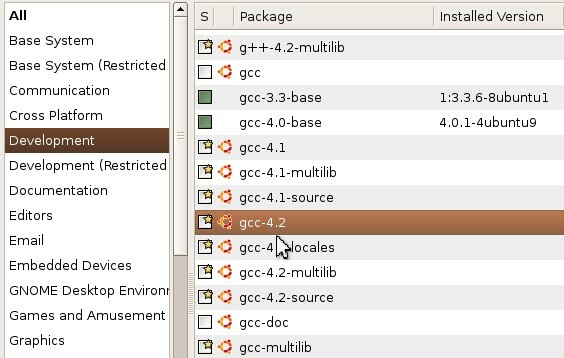 Then select Applications / Accessories / Terminal, and type "gcc" or "g++". You should now have a working compiler. may often result in an endless trying-around with all kinds of tools. First of all, try the sfk ftp, which should be working in most cases. To add multimedia support to Linux, it is highly recommended to download a different, up-to-date appliance. 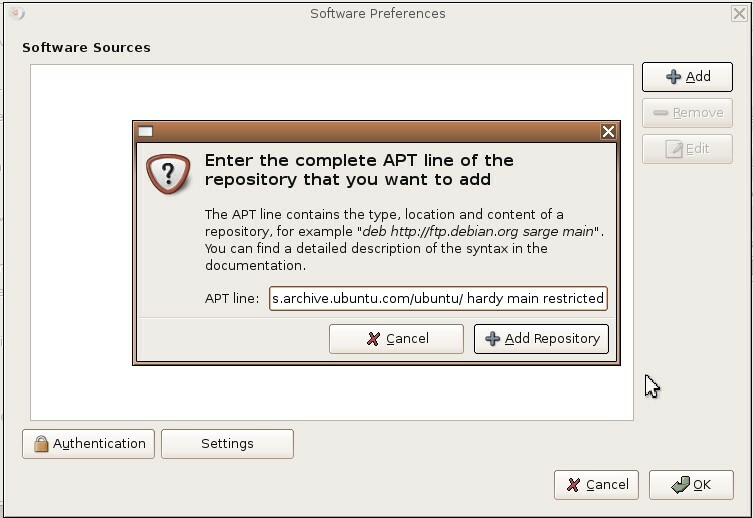 I'll list the usual required steps below, but with Ubuntu 5.10, you may have to find the correct package sources first. run synaptic packager, activate all sources. search and add gstreamer packages, but exclude 0.8 and -dbg packages. add gxine, libxine-extracodecs, mplayer, mozilla-mplayer, vlc. search the web for the "plf repository", "w32codecs" or "win32codecs"
to get .avi and .wmv support. the "gxine" plugin for firefox seems to crash on video playback, therefore deactivate it, by moving /usr/lib/firefox/plugins/gxine into a parallel directory, e.g. "plugins2". if flash isn't working correctly, type "about:plugins" within firefox and check which .so files are registered to display flash. if you find multiple entries, it may help to deactivate the first .so, again by moving it into another directory (e.g. plugins2/) where the browser cannot find it. restart the browser, and retry.